Everyone gets sad or has a bad day now and then. When this happens to our friends, our family, or our co-workers, we want to do whatever we can to cheer them up. Sometimes it’s hard. Cheering someone up after they’ve lost a loved one or just received bad news about their health, for example, is very difficult. However, sometimes it is possible to make someone smile when they need it. Little things can cheer someone up. Just saying good morning or smiling might be enough to make someone a little happier than they were before. People like to know others care about them, so an acknowledgement of any type can make someone cheerful. Stop and chat for a moment, hold the door for someone, or just make eye contact. Sometimes this is all that’s needed to give someone a little boost. Of course, sometimes more is needed. Sometimes you need to send flowers or give someone a small little pick-me-up gift like chocolate or cookies. These little treats can help cheer someone up and make them, at least temporarily, forget about the bad news or event that has gotten them down. Flowers or cookies might not make the world a perfect place, but they can help for a few minutes. Sometimes those few minutes are key in helping someone through the bad times. Another way to really cheer someone up is to spend some time with them. Take them out to lunch or dinner, or invite them over to your home for a movie or other activity. Sometimes people need to be distracted from whatever has them depressed, and there’s nothing like spending time with someone to do that. No matter what you do, your friend, relative, or co-worker will be thankful for your help. 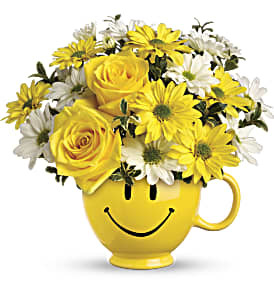 By providing a little cheer in their otherwise dreary day will really help them, and you can be sure they will repay the favor the next time you need a little cheering up.